I only went out for a walk and finally concluded to stay out till sundown, for going out, I found, was really going in. -- John Muir, 1913. That sentiment is one all of us feel strongly about, otherwise why would we be supporting a botanical garden? My husband’s only complaint is that I forget to come back in. My favorite time in the garden is at dusk when the light is changing and wildlife starts murmuring. I wipe the sweat off my brow for the umpteenth time and know that whatever task I was working on is done for the day, finished or not. Some of the tasks around the Garden this week were driven by the preparation for the Marco Island Men’s Club Thursday, October 9th, and the bridal show put on by the Wedding & Party Professionals of Naples (WPPN) Sunday, October 12th. The visit by the Marco club brought out nearly 50 Marco Islanders. After the group had lunch in the Windstar Garden Room, Brian Galligan and Chad Washburn pointed out the highlights of the Tropical Mosaic Garden. WPPN’s event on Sunday afternoon was for anyone planning a wedding. There were 40 or so vendors around the grounds and in the Windstar Garden Room selling everything from wedding gowns, cakes, honeymoon travel, planning and catering services. A giant tent over the runway on the oval lawn made a perfect setting for the fashion show. For these visits, the grounds were spruced up (that sounds like a northern term, doesn’t it? ), including the Windstar Garden Room. New plants were deftly tucked into the coral planters and fresh palms dropped in behind them. The Pink Courtyard pots were refreshed by yours truly. Some pots needed more color or reining in of chocolate sweet potato vine (Ipomoea batatas ‘Blackie’). Plants that had run their course were replaced by whatever I could find in the nursery. One such find was young silver agaves (Agave americana ‘Blue Huntington’), which I placed in the middle of two pots overflowing with sedum rosettes, possibly Sedum cauticola 'Lidakense'. The bed under the caesalpinias (Caesalpinia granadillo ‘Bridalveil’) and white begonias (Begonia alba) enjoyed color from yellow gaillardias (Gaillardia pulchella) most of the summer. 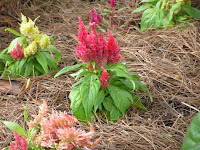 Those fading blooms were replaced with cockscomb (Celosia argentea) in every shade of the rainbow. It’s a hot, dry spot that’ll test its stamina. In our continuing search for special plants, Carolyn Miller and Brian Galligan took to the road again to visit a nursery in Sarasota owned by Faith Bishock called Rare Palms & Tropicals. This was a lead we gleaned from the Croton Society meeting I attended in September. Besides obtaining a highly desirable assortment of young palms, the owner donated an African Palmyra palm (Borassus aethiopum) in her husband John’s name. Speaking of the Croton Society, I took a ride up to Tampa on Saturday to assist that group in their fall plant sale at the University of South Florida’s Botanical Garden. While lending them a hand I learned more about crotons. I brought back two cultivars for the Garden collection: ‘Congo’ and ‘Queen Victoria’. While at the sale, I interviewed one of their charter members, Phillip Stager, for a future article in the Croton Society newsletter. After the sale, Phillip gave me a tour of his croton collection in St. Petersburg. 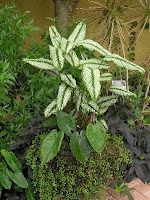 The Garden joined the Croton Society this year and will be depending on its experts to help us identify the cultivars we have and still need. This season’s events include the Fifth Annual Hats in the Garden on Wednesday, November 12th, 2008. This event, the largest fundraiser of the Garden’s social season, is nearly sold out. That’s our high-society lunch under the tent in the parking lot. It’s quite the fashion show for hats and other elegant apparel, as you can imagine, and we always hope it won’t be windy. For those of you in town, there are more opportunities to visit us. There are two dates for Tropical Mosaic visits this week — Wednesday and Saturday, October 15th and 18th. Please call 643-7275 to make a reservation. Another way to visit is volunteering. There’s plenty to do, in the dirt or otherwise. We’d love to see you, either way.